This Blog is created to keep up the notes or articles for the courses related to Geotechnical Engineering and Underground Structures. If you need some article on any specific topic, please leave a comment in the comment box, or write in to my Google+ or other profiles(links given below). compare, using equations, how much longer it would take a clay to settle in the case of single drainage, with that in the double drainage. I think this is the correct solution, if you find any problem with the solution, please suggest in the comment box. 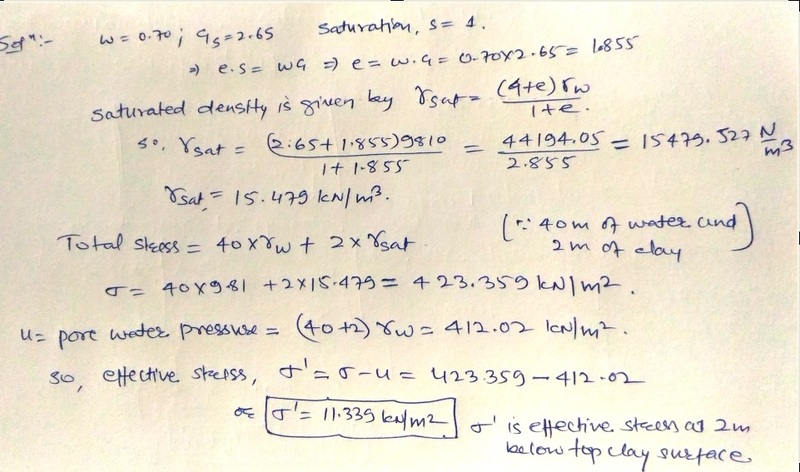 Given problem is to find the effective stress at a depth of 2 m from the top of clay bed in offshore, where the water depth is 40 m. Given for clay is G =2.65, water content is 70%. One of the main factor of rate of consolidation and the time of the consolidation is the single or the double drainage. When there is a double drainage, i.e. drainage from both of the opposite faces, the drainage path becomes half of the total thickness of the clay layer. In such cases the time of settlement decreases significantly. The following example illustrates the same. Example: (a) A 20 mm clay layer with double drainage reaches the 90% of total consolidation in 30 minutes. Find out the coefficient of consolidation. If the same clay has a thickness of 10mm, find out the time it would take to reach 90% consolidation with (b) single drainage (c) Double drainage. Draw the settlement curve/consolidation curve in each case. Solution: For solution please zoom into the picture below. 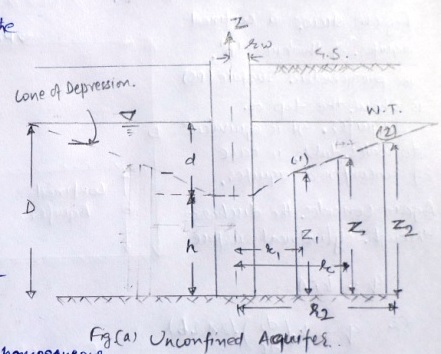 Expression for permeability of an Unconfined Aquifer. In pumping out test, the water is pumped out through a tube well, until a steady state is reached. The water table around the well turns into a cone of depression. 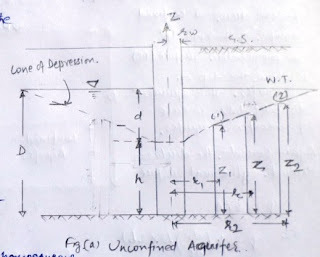 The maximum depression along the centre line of the well is known as the drawdown(d). Flow follows the Darcy's law. Soil mass is isotropic and homogeneous. Well penetrates the aquifer to reach the impervious bed. Steady flow along the soil. Co-efficient of permeability is constant throughout. Natural water ground regime doesn't change. Also it is assumed that the slope of the hydraulic line is small and so it can be taken as the tangent of the angle, in place of sine of the angle. Consider flow through a cylindrical surface at a distance of 'r' and of depth 'z'. Further equation are given in the image below. Flow can be estimated to a rough value using the influence radius of the well. Influence radius is the radius of the circle along which the effect of the pumping are observed. It varies from 150m to 300m. According the Sichardt, it can be found as follows. R = 3000*d*(k)^0.5 , here d = Drawdown, k = permeability. Further, permeability can be calculated using the influence radius as given in the formula in the image below. Reference : Buy the book online from the link given below. 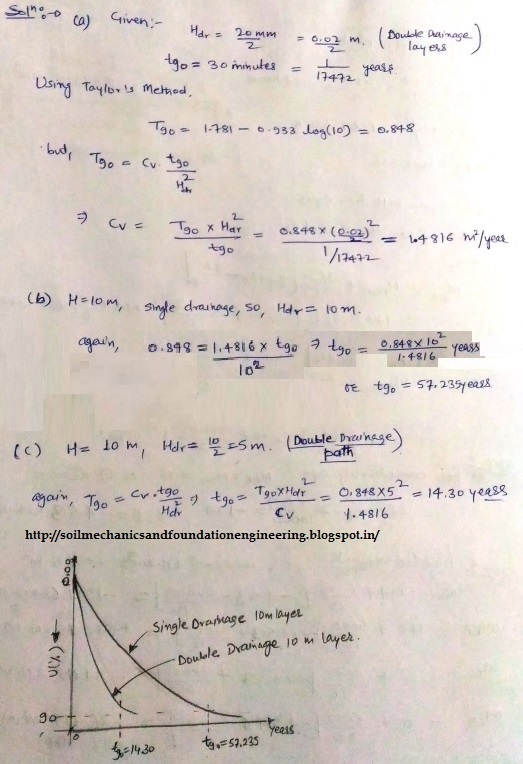 Book Title: "Soil Mechanics and Foundation Engineering" by Dr. K R Arora. A lateral thrust is applied by the soil backfilled behind a wall at rest, this thrust is known as the lateral thrust at rest. Walls which are restricted against any movements or moment come under this category. Example can be a basement wall, which is topped with a RCC slab, and therefore restricts its movement. The amount of thrust on the wall depends upon the properties of the soil. 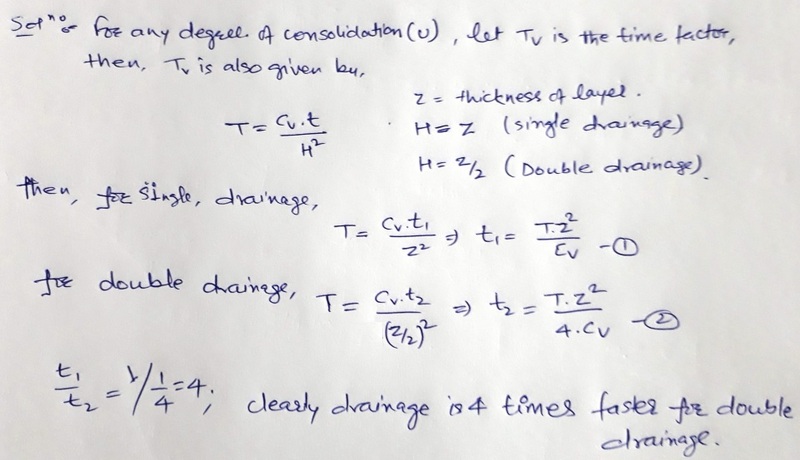 Density of the soil, angle of friction, degree of the consolidation and the level of the water table are the major factors which govern the magnitude of the lateral thrust. OCR= 2, 𝜙 = 35°, 𝛾𝑑 = 19.7 kN/m3. Find the lateral thrust and its location from base. Fig. Lateral Thrust diagram for wall at rest. 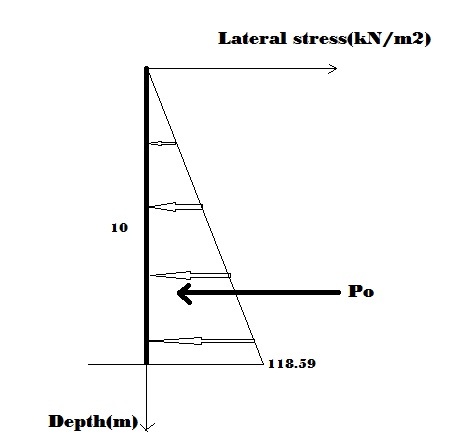 Lateral thrust acts at the centroid of the lateral stress diagram, i.e. 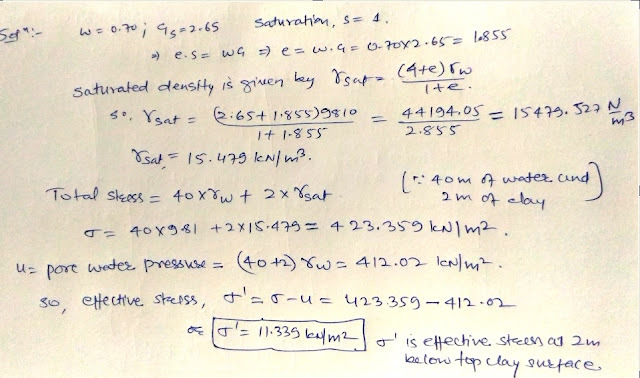 at a height of H/3 from base. H/3 = 10/3 = 3.333 m from base. When and why the mat or raft foundations are used? Q. When and why the mat or raft foundations are used? When the columns are so close such that their footings nearly touch each other. When the soil is weak and having the low bearing capacity. Where chances of differential settlement exist due to either the existence of the different soils or variation of the moisture content. or where there is a large variation in the loading in the adjacent columns. 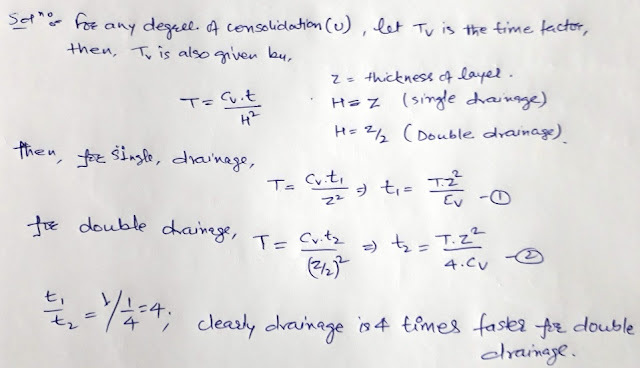 reference: 'Analysis and design of substructures' by Swami Saran. As we know, rock-masses are the complex structures. Failure of the rock-mass occur by the development of the fractures or slip surfaces, when the stresses get increased from the strength of the rock mass. First three uses empirical approach, and have considerable value for the design of excavation, while the last one has value for understanding the fracture initiation in the rock.